I am John Robson. I danced with the Apple Chill Cloggers for a little over 12 years, from the team’s inception to May 1987, and possibly beyond. During that time I lived in Chapel Hill and was an economist for the U.S. Environmental Protection Agency, with an office in Durham, NC. My first exposure to clogging was on October 12 or 13, 1974. It was at a Glenn Bannerman workshop in Raleigh. Shortly after that workshop Hunt Mallett and Trent Van Blaricom began teaching clogging in the living room of an old house in Carrboro. Most of the initial trainees, including me, came from the Chapel Hill International Folk Dance Club. We beat the Carrboro living room floor almost to shreds, and then as others joined in, we moved to better quarters and grew to a core of four couples. Hunt and Trent taught us the Carolina Star, a Green Grass Cloggers routine. Vacillating between calling ourselves the “Old Well Cloggers” and some variation of the “UNC Cloggers,” in early March of 1975 we gave our first performance at a fraternity party. It was a disaster, but the audience was drunk and not concerned with the quality of our dancing. In early April we tried again, this time at the Chi Psi fraternity, and there we regained a modicum of confidence. 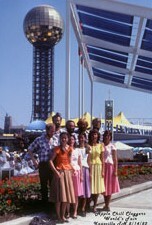 Our April 20, 1975 performance of the Carolina Star at the Apple Chill Street Fair was epic, and we were launched! Under the enthusiastic (but unofficial) leadership of Ron Raxter and Susan Gramling, we assumed the name “Apple Chill Cloggers” and set out on a very busy schedule. We entertained, competed, spread the clogging culture, promoted our name, had a lot of fun, and most of all, enjoyed our new celebrity status. After forays into South Carolina and Georgia, and about 25 performances throughout North Carolina, we incorporated as a non-profit corporation. That was on November 14, 1975. I believe I danced at every one of our performances in 1975, and at 80 to 90 percent of them over our first ten years. I turned 40 just before the 1975 Apple Chill Street Fair, and now I look back at my 40s as my dancing years. On January 12, 1985 the Apple Chill Cloggers performed at a shopping center in Hickory NC, and there I met the mother of Linda Fullwood, one of the Apple Chill Cloggers. Peggy Fullwood now is my wife. As the Apple Chill Cloggers turn 30, I am stepping into my 70s, sad-to-say. While the cloggers have danced to musicians older than I, I believe I always was the oldest Apple Chill Clogger. During my clogging years I was a single parent with three kids: Forrest (youngest), Leslie, and Elena (oldest). I brought Forrest and Leslie along on many clogging trips, particularly ones when we camped out. Forrest became the Cloggers’ banker, so-to-speak, collecting admission at many of our performances and square dances. He became a fixture at the Station in Carrboro in the years we used the restaurant to hold regular Tuesday evening dances and clogging lessons. Every clogging trip and every performance was an experience. Some performances earned us standing ovations. We danced on stages, on grass, on blacktop, on unstable and frequently unsafe platforms, and even on the back of a moving truck when participating in a parade. We dealt with stubborn cloggers who suddenly refused to dance a particular routine, or who refused to dance at all, frequently doing so right before we were scheduled to go on stage. We worked with cloggers who beca me too—shall we say—unstable to dance, but nevertheless were critical to our performance. We turned ourselves upside down convincing some dancers that we could not afford to have an overseas trip disrupted because one of us was caught with, ah, recreational substances. We argued incessantly over the nature of changes we had made to routines, because usually we neglected to write down the changes. This allowed everyone to retain his or her own individual memory of how the “new version” was to be danced. Here is an excerpt from a letter I wrote on April 18, 1977, 10 days after a performance at the Old Time Fiddler’s Convention in Union Grove, NC. How many Union Grove festivals have you been to? I’ll have to admit—after the last one I wonder what you see in it. People were so stoned & drunk it was sad. Bottles, broken bottles, cans, trash, everywhere. People passing out, throwing up, urinating everywhere. Toilets basically unusable. Drugs of all sorts being peddled. Dust, dust, dust, except where there was mud from so much urine, and people falling in the mud. Smoke—it was clear and cool and at night it was cold. So much smoke we cried. A screaming, wild crowd of 10 to 20,000 to watch us clog—largest live audience we’ve ever had. But I doubt that we’ll go back. It really makes you wonder what’s up with the modern generation. 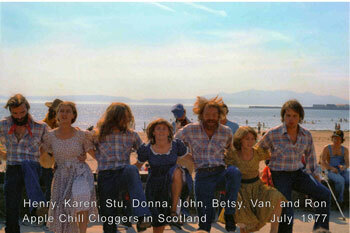 I retired from the Apple Chill Cloggers in August 1986, just after our arrival home from Belgium. Occasionally, through May 1987—and possibly later—I returned to the Cloggers to fill in as needed.